News | Watt a Concept: Electric car builders are powering up all over Utah. In 2006, the electric car was dead, scrapped into a memory. Major automakers focused on producing trucks and sport-utility vehicles. Gas was cheap and miles per gallon were hidden away on sales stickers. Then, this summer, gas prices soared past $4 a gallon. Out of the frustration many drivers suddenly felt, the electric car was reborn. An e-vehicle revival is alive in Utah, where the movement’s enthusiasts are an eccentric bunch. They span the state from Hurricane to Sugar House. They represent a range of ages and occupations. They are abundant with curiosity and a do-it-yourself attitude. In Salt Lake City, Dansie is leading the fight to extinguish the internal combustion engine. He founded Zero Emission Vehicles of Utah to bolster the ranks of the electric movement and help others break their dependency on oil. It wasn’t always like this. Dansie was on the other side, a car enthusiast and the more fuel-hungry the better. In his spare-time, Dansie rebuilt antique cars and Harley-Davidson motorcycles. In essence, his mission was ensuring the legacy of the internal-combustion engine lived on, but no longer. While protecting the environment is a motivating factor, some electric-vehicle enthusiasts simply want relief from high gas prices. 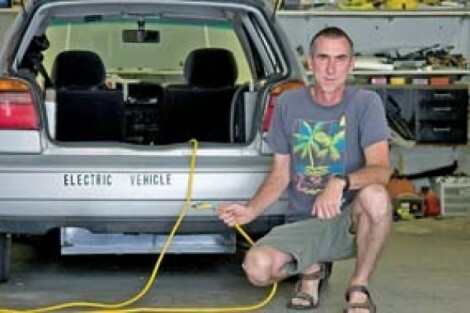 Not everyone is championing these idealistic do-it-yourself electric conversions. Locked inside their garages crafting ideas into reality, electric-vehicle enthusiasts find the learning curve for a conversion is steep. Trial-and-error and figuring out the different components take the most time. Dansie recounts rebuilding his second project, a 1994 Volkswagen Golf, twice just to reconfigure the batteries. While each initial conversion took hundreds of hours, done mainly on weekends over a period of several months, most speculate they could complete their next conversion faster. West Jordan’s David Foy is converting “Blue Bug,” a 1998 Volkswagen New Beetle. Most conversions, he says, can be done in less than 40 hours. Foy, whose motivations are rooted in curiosity and business opportunities, believes the electric-car market will grow over the next several years. He’s also working on developing products such as battery boxes to make future conversions less time-intensive. Mainstream appeal of electric vehicles depends on improving limitations such as charging capacity and range. But the future seems bright. By late 2010, major automakers will have electric vehicles in showrooms. But critics question if the automakers can satisfy the demand. “As the technology continues to progress, the driving range increases and the cost decreases, we expect that [electric vehicles] will become more prevalent,” says Karen Matusic, spokeswoman for the American Petroleum Institute, a trade group representing the oil and natural gas industry. Current electric vehicles range 50-60 miles per charge with top speeds of 55 mph. Refilling the battery is a little trickier and more time-consuming than fueling a car. Charge times vary from a couple of hours for a motorcycle to five or six hours for a car. Increasing the voltage for a quick charge can bring the vehicle back to full power in half the time. Although charging stations don’t exist in Utah, a standard 110-volt outlet does the job. Occasionally, Dansie uses the outlet on the maintenance building at his place of work. A $2,500 tax credit for the vehicles helps, but conversion still doesn’t come cheap. Costs vary with each vehicle and desired components. For instance, different battery types such as lithium-ion or lead-acid may be used—but lithium-ion batteries cost substantially more. A lower-end conversion like a Volkswagen Beetle could be done for around $5,000; a motorcycle for slightly less. In spite of the steep initial investment, electric enthusiasts are quick to point out the long-term benefits of owning a vehicle that is maintenance free and not tied to rising gas prices. Instead, electric vehicles enjoy fuel prices about a penny or two per mile. “It has given me great pleasure this week to cruise by those gas stations this week with the $3.89 sign out for regular,” Dansie says.